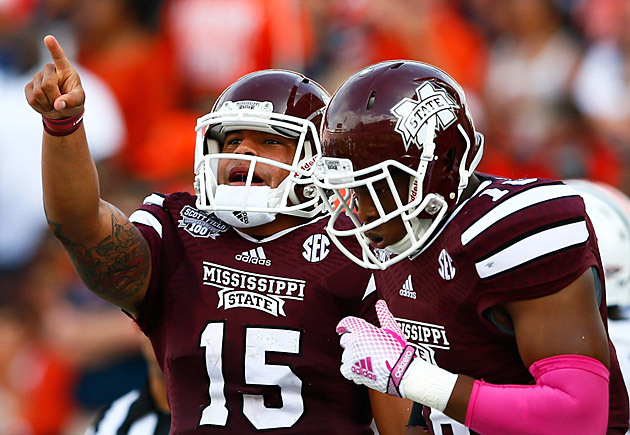 The Mississippi State Bulldogs are ranked No. 25 in Sports Illustrated's 2015 college football preseason Top 25. For the complete listing of SI's preseason Top 25 rankings, click here. A 1–2 finish to the regular season and a 49–34 Orange Bowl loss to Georgia Tech dulled the buzz from the Bulldogs’ historic 2014 season, which began 9–0 and featured the school’s first No. 1 ranking. To try to ensure a happier ending in ’15, coach Dan Mullen cranked up the tempo of State’s offense this spring. The speedier approach exploits senior quarterback Dak Prescott’s command as a third-year starter who accounted for 4,435 yards and 41 touchdowns in 2014. It also helps mask the Bulldogs’ biggest weakness: an offensive line that lost three players who had combined for 113 career starts. A diverse and deep receiving corps will create huge mismatches and invite touches in space. Expect monster years from dynamic junior slot receiver Fred Ross Jr. (6' 2", 207 pounds) and a future vertical threat in the NFL, junior De’Runnya Wilson (6' 5", 215). Look for redshirt freshman tailback Dontavian Lee (6' 1", 227) to emerge as a star by midseason. On D, senior corners Taveze Calhoun (25 starts) and Will Redmond (Mel Kiper’s No. 1 senior corner) are the SEC’s top blend of experience and talent. Their blitzing ability will alleviate pressure on the two new starters at safety and give end Ryan Brown (31⁄2 sacks, seven TFLs) time to corral QBs. Dak Prescott makes it all go. He’s such a threat to run that you can’t go help out on the 6' 5" receiver [De’Runnya Wilson] or blitz often to create havoc on a young offensive line. To try and stop Prescott, you need to keep him in the pocket, eliminate escape lanes, take away the shorter passes and force him to throw down the field. He could be more of a factor if they go tempo, because one missed alignment or read and he can get them points very quickly ... Defensively, they were as good a front seven as we saw all year. They reminded me a bit of the San Francisco 49ers. Even with what the Bulldogs lost, they’ve still got big, physical guys up front who can run. You need to keep them moving and attack the perimeter; you can’t do a whole lot of straight-ahead running. LSU’s visit to Starkville in Week 2 looms as a pivotal game—and a loud one: With kickoff at 8:15 p.m., the clanging of cowbells is likely to be heard throughout Oktibbeha County. After back-to-back meetings at Auburn (Sept. 26) and Texas A&M (Oct. 3), the most brutal November in college football awaits: at Missouri, Alabama, at Arkansas and Ole Miss.